The journal was founded by Kamianets-Podilskyi Ivan Ohienko National University, G.S. 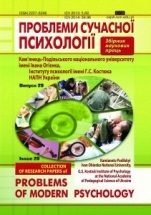 Kostiuk Institute of Psychology at the National Academy of Pedagogical Science of Ukraine. It specializes in developmental psychology, social pedagogy, psychology of education. The editorial board includes international scholars.